The way you do even the simplest of things can often reveal a lot about the kind of person you are, be it about how you deal with problems or how you are in a relationship. We often don't take notice of our little habits, of the unique ways in which we do the smallest things, but they can tell us a lot about the way our brains work as well as our personalities. 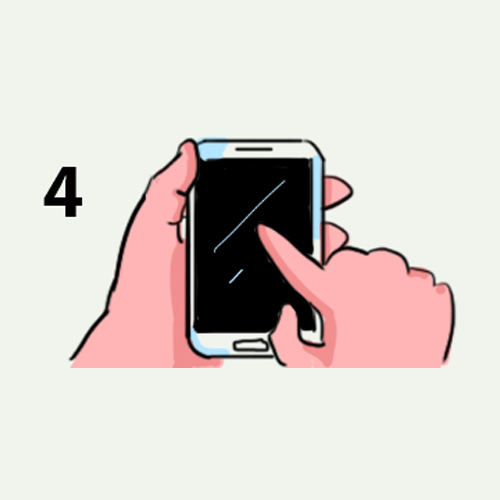 The way you hold your phone can say a lot about the way you think and function, and you'll be fascinated by how much you can learn about yourself. 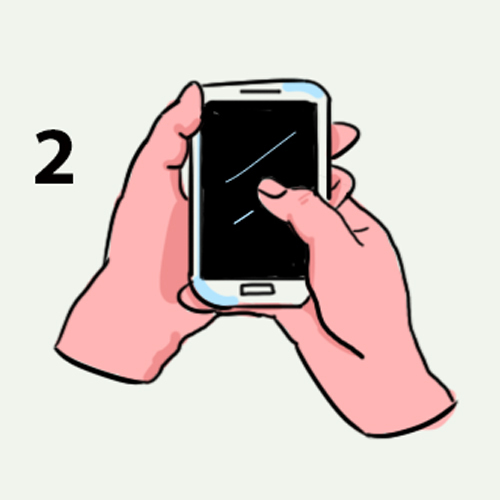 If you use just one hand to hold and operate the phone, using your thumb to click and scroll through your feed, then you have a carefree personality. You like to look at the bright side of life. You don't worry about problems too much because you take everything that life throws at you in stride. You have confidence in your abilities, and you are quite self-assured. Your belief in yourself makes you ambitious and you are willing to push yourself to new limits just to see what you can achieve. This also means you're a risk-taker, and are often rewarded for it because the chances you take are backed by your drive to succeed. However, when it comes to relationships, you are not as willing to take risks, often playing it safe. You are not quick to rush into commitment, often taking months before you decide if the person you're dating is the one for you. Your lovers may often find you detached, but once they win your trust, you're all in, no holds barred. 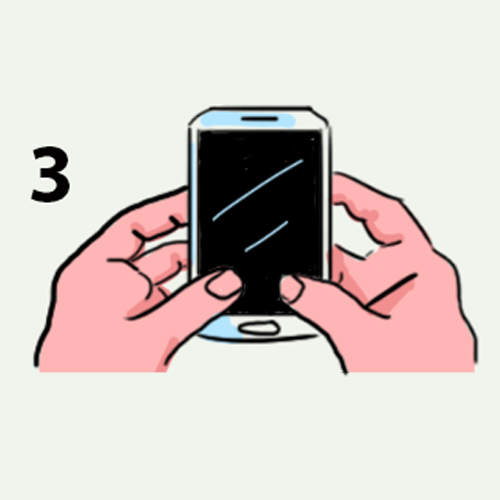 If you're using both hands to hold your phone, with one for support, and the other for maneuvring around your screen, then you're pragmatic and wise. You prefer to err on the side of caution rather than risk losing everything on a whim. You are an extremely intuitive person. It's hard to deceive you because you are ever-vigilant, and you are also extremely sensitive to other people's thoughts and emotions. This also makes you a fairly good judge of people's character. However, you use this ability to be empathetic and caring rather than judgmental and manipulative. When it comes to relationships, it takes just one date for you to decide if the person is worth your time and effort. Once you are smitten, you hold nothing back, even if the other person wants to take it slow. You are willing to make an effort to get to know the other person deeper, but sometimes your hastiness can cloud your judgment and you may end up with someone who doesn't truly deserve your love. 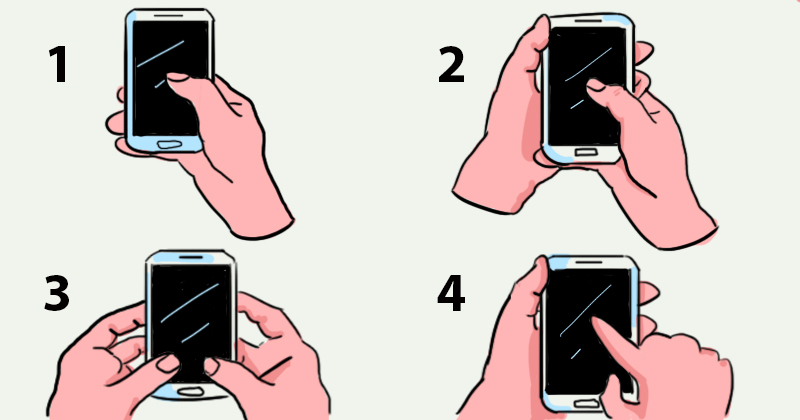 If you use both your hands to hold your phone and scroll and type using both thumbs, then you're the kind of person who likes to do things quickly and efficiently. You have a brain as nimble as your fingers, and you can analyze a problem and come up with a solution within seconds. You are a rather versatile person, able to adapt to the changing demands of different situations. You're energetic at parties, serious during intellectual discussions, and carefree when in the company of children. Your intelligence encompasses several dimensions, and you have a wide variety of skillset at your disposal. However, in love, you can't win a person's heart the same way you would solve a problem. You are often stumped when it comes to wooing someone attractive, and your efficiency often fails you. Eventually, you learn how to put in the effort and time it takes to prove your love. This is one of the reasons why you end up having deep, enriching relationships. 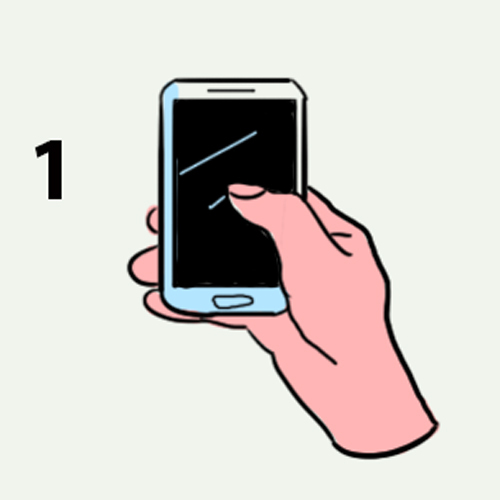 If you're holding your phone with one hand using the index finger of the other hand to go through your feed, then you're a creative person with a rich imagination. You are able to envision possibilities and futures that transcend reality, and people are often awed by your unique ideas. You tend to come across as quirky and whimsical, as there is a world of thought that goes into every single thing you do, and people are often unaware of this. Though you are a spontaneous and exciting individual to be around, you sometimes prefer to detach yourself from the bustle of the crowd and retreat into a solitary place to replenish your energy. You're shy when it comes to relationships, and you're both afraid to make the first move and to respond to someone else making a move on you. Some people may take your reticence as a lack of interest, but when they really put in the effort to know you better and draw you out of your comfort zone, they'll be amazed at the kind of person you are and are rewarded with surprises every step of the way.